nice one bergsmlerg if you provide the measured specs and engine specs and application in a question on SpeedTalk you will get some seriously knowledgeable responses and no doubt end up with something web cams already makes. currently all you have is self promotional bumblings from the site Troll who's claim to cam profile design is that he copied someone elses 10 year old profiles, had them made out of cheese and gave them different names. No action yet, 14 hour days after the hour bus ride each way. Work close to home they said, home every night they said. 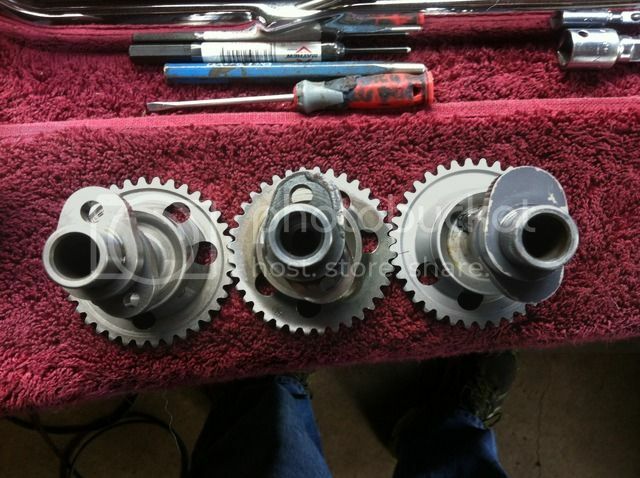 The one on the far right is as big of lobe as you can fit and required just a bit of work to the rocker shaft to get it clearance. Middle cam did not require any mods to fit. I do not have specs on the cams but they do work. To get a cam done for these motors you must start with a stock cam and then they are hard welded and reground to new specs. I might part with the cam in the middle, I got it used and it is not pretty but it works. I do not need three cams. Edit: Thinking about this again...I called webcams and they can produce pretty much any cam profile you desire from an oem core. I have half an idea what cam would be good in there timing and lift wise. What makes things a tad diffo is that they do not have a head to measure the cam in so any directions/specs needs to be translated to directly on the cam. I could try Jens at former husaberg and see if he has the rocker arm ratio still, if so this could work. Another option of getting info may have opened up today as I did some dyno stuff for a guy quite involved in KTM. Last edited by TomTom; May 1st, 2015 at 10:41 AM. I will soon disassemble my motard and if you have a good plan for a cam profile we could send my head and our cams to them. Torque Monster, that "very crazy cam" looks indeed very crazy! Last edited by jon andersson; May 1st, 2015 at 12:43 PM. A bit of work yes, but plausible. Manage this and we have a profile that we know and will be free for anyone around, as in exactly what were looking for. Jon, will it be ok for you to this later this season? Like late july? Cramped up badly now but by then much better and Ill have the energy to make the calls necessary. If its head off on, I can make myself prioritise that too, rather the first option if possible? Much smoother to me. Last edited by TomTom; May 4th, 2015 at 10:10 AM. Just fine by me. Plenty of projects in my life and and that bike is sadly quite down the list right now. But whenever the head needs to go off I can do it in no time. First time I've done this so if it sounds off let me know. Measurement taken at valve spring retainer, lift numbers I don't trust as it's impossible to get a straight shot at the retainer.